In this review, we here at Review2Sound are going to take a look into this product by Keith Dean. Keith Dean developed an easy guitar method intended for active adults and made it available through the Adult Guitar Lessons. This will help you build hand and finger strength while minimizing the forearm fatigue. Keith is a pro guitar instructor who has a deeper understanding on adults wanting to learn guitar but could never find time. Both frustration and disappointment may occur when someone tries to learn the guitar. Keith’s guitar playing experience has spanned over thirty (30) years. Part of his experience is the chance to share the stage with popular artists such as Wild Rose, Jason Aldean, Little Big Town and more. He also owns a famous music store and become a published song writer. Literally, Keith eats and breathes music. He finds teaching countless students how to play guitar is his life-long mission. Moreover, he believes, like himself, anyone can play the guitar and become an in-demand player without proper education. With his Adult Guitar Lessons, he wants to provide you with quick and simple video lessons. You can easily pick up everything and start from scratch. There are more than a hundred lessons provided from beginner to intermediate. You can easily learn to play music from this generation and enjoy the guaranteed results. 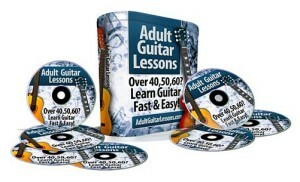 Adult Guitar Lessons Features Overview. Learn how to play guitar by feel and by ear. Discover the shortcuts to determine and play any chord progression. Learn some important scale patterns that will unleash the mysteries of playing solo guitar. Discover the secrets to simple form chords. Learn songs from just listening to recording. Enhance your timing and be an expert when it comes to a complex rhythm. Find out how to change chords smoothly. Although there is plenty of guitar-playing information from the web, the Adult Guitar Lessons can offer you more. Free lessons and videos might help you in some aspects, but it will be a test to bounce from one site to another. You might encounter information overload, leading to anxieties. There are so many guitar players today who professed themselves as Google Guitarists. There is nothing wrong with this, but this journey presents more challenges. The Adult Guitar Lessons gives you the right to get your hands on the 30 years worth of hard-won guitar playing tricks, techniques, tips and more. This is an all-inclusive simple-to-follow a step-by-step course. You do not have to wait for such a long time to learn almost everything about guitar playing. Online lessons in the multi-media format that includes more than 100 video lessons. Lessons supported with written explanations, TABs, chord diagrams, color pictures, jam tips, music charts and more. Unlimited updates for the course. 7 Steps to Success on the Guitar e-book (limited period). One-on-One Guitar Coaching (Bonus #1). 10 Steps to Successful Songwriting (Bonus #2). 15 Things You Have to Know About Playing in a Band (Bonus #3). I hope we helped you have a quick look at what Adult Guitar Lessons can offer you in this review.